The RKE transmitter may work up to 60?€‰m (195?€‰ft) away from the vehicle. Press to lock all doors. The turn signal indicators may flash and/or the horn may sound to indicate locking. See ?€?Remote Locking, Unlocking, Starting?€? under Vehicle Personalization. If the driver door is open when Q is pressed, all doors lock except the driver door, if Unlocked Door Anti Lock Out is enabled through the vehicle personalization. See ?€?Unlocked Door Anti Lock Out?€? under Vehicle Personalization. If the passenger door is open when Q is pressed, all doors lock. Pressing Q may also arm the theft-deterrent system. See Vehicle Alarm System. Press to unlock the driver door or all doors. See ?€?Remote Locking, Unlocking, Starting?€? under Vehicle Personalization. The turn signal indicators flash to indicate unlocking has occurred. For more information see ?€?Remote Unlock Feedback?€? under Vehicle Personalization. Pressing K may also disarm the theft-deterrent system. See Vehicle Alarm System. For vehicles with this feature, press to release the trunk. Press and release one time to initiate vehicle locator. The exterior lamps flash and the horn chirps three times. Press and hold 7 for at least three seconds to sound the panic alarm. The horn sounds and the turn signals flash for 30 seconds until 7 is pressed again, or the key is placed in the ignition and turned to ON/RUN. 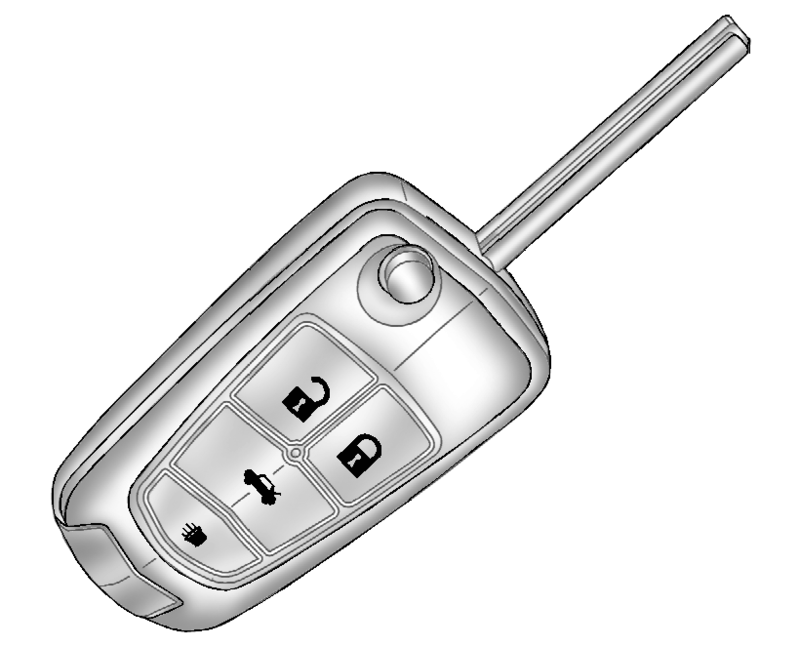 For vehicles with this feature, press and release Q and then press and hold / within five seconds to start the engine from outside the vehicle using the RKE transmitter. See Remote Vehicle Start. The buttons on the RKE transmitter are disabled when there is a key in the ignition. Push the button on the transmitter to extend the key. Remove the battery cover by prying with a finger. Insert the new battery, positive side facing up. Replace with a CR2032 or equivalent battery. Snap the battery cover back on to the transmitter.